As a person who shares her life with canines I have come to learn some immutable truths. Dogs poop. Bigger dogs poop bigger. Poop, like matter, is never destroyed. Poop is a four season gift. I’ve gotten savvier about poop scooping in the six plus years I’ve lived with hounds. At some point I discovered the beauty of the little rake and dust pan attached to long handles designed to make scooping poop so much easier on your back. For a long time I refused to pay the twenty dollars they retail for. I would pick up all the poops in plastic shopping bags, bending over laboriously and ending the mission with an aching back. In a moment of weakness I broke down and bought a rake and dust pan in shocking pink. Somehow the pinkness of it made the price and the purpose of the tool seem somehow not as bad. I’ve learned that the promise of a Doggie Dooley is WAY overrated and it is much easier to launch the poo over the back fence into the woods. I wouldn’t recommend this technique for people with neighbors close by as they don’t take kindly. But you can hurl excrement quite a distance and still be on your own property when you live smack in the middle of three acres. The system breaks down in the winter though. I have to snow blow designated areas in the back yard for potty breaks or the kids end up using the base of the back porch stairs and right in front of the fence gate which drives Mumma insane. Depending on the rate of snowfall in any given winter, this can cause poop congestion in short order. It’s not all bad though since they become poopsicles almost as soon as they hit the ground. No one comes in from the backyard having stepped in a mess. I can also attest to the fun of launching these poopsicles far into the woods via snow blower. I don’t recommend accidentally launching a poopsicle up onto your roof, or hitting frozen siding with a rocket propelled poopsicle. If you do, be prepared for springtime repairs and a trip to your house top to sweep off freeze dried dog patties. I know whereof I speak. Inevitably spring rolls around presenting the biggest challenge of all the seasons excrementally speaking. Snow melts and you begin to find all the poop you didn’t snow blow into the woods. You have to be vigilant and keep up with the rate of melt lest your back yard become a bog of mud, mole hills and poop in various stages of decay. From my Twitter friends I learned a great term for this joyless springtime task – an Easter egg hunt. The poops have weathered to the point of camouflage, easily hiding among the dead grass and rotting leaves you didn’t bother to rake up in the fall. You must hunt to find them and oddly, you are pretty happy when you do. As though you just found an Easter egg. You step very carefully and slowly whenever you venture into the backyard in the spring. You check eight hound feet after every out before they cross your threshold. That’s four outs x eight feet…thirty-two checks a day! Still as sure as spring moves on into summer, you eventually sweep the minefield clear and you’re back to doo-doo flings over the back fence. They say to everything there is a season. Unfortunately when the thing is poop, it is every season. When I got Girly Girl, my first greyhound and heart dog, I had decided the rule of the house was going to be no hounds on the furniture. Human beds were for humans and dog beds were for dogs. That lasted until the first time GG gave me the puppy dog eyes and asked to sleep on my bed with me. I melted and then caved. Once the floodgates are opened there is no shutting them. Subsequently Blue would join me on the bed until he was supplanted by Bettina. On that score, poor Blue had no choice. She claimed the bed and refused to let him up. Poor baby, he rarely dares enter the bedroom any more despite my frequent attempts to show him he has seniority. Bettina’s usual routine is to wait until I get settled into bed and then join me. She hops up on “her” side of the bed and checks everything out. Then she spends some time determining exactly where she will lay herself down. Most often, she sleeps with her back to the edge of the bed. Her four legs are stretched out and her feet are touching my back. During the course of the night, I am usually awakened a few times by a foot in the armpit or a kick to the stomach. Bettina is as restless a sleeper as her mumma is. Lucky me. By morning, she is usually spooning me with her head on my pillow, snoring and drooling. The other night, like most nights, Bettina assumed her usual position on the bed and after reading a short while, I turned out the lights and we were soon asleep. At some point during my lovely slumber I became aware of a strange sensation. Bettina had worked her way towards the end of the bed and was dreaming. 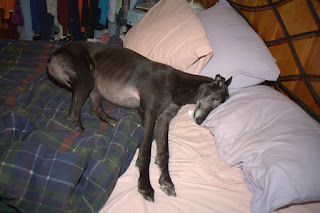 I had been awakened by four greyhound feet drumming out a racing rhythm on my behind. The dream race picked up momentum and her feet were furiously pistoning against my poor backside. When you wake up in this situation, you don’t really know what the proper protocol is. Do you do the polite thing and let her finish her race? Do you wake her up and prevent worse gluteal bruising? I was sleep befuddled and at a loss as to how best to proceed. Bettina, in her dream, certainly had no trouble proceeding and the race continued. Eventually I give up trying to reason anything out in the middle of the night. I waited while she finished up her race. Her sharp clawed paws drumming and clawing and kicking me in the posterior. It’s possible that the racing surface she was using somehow replicated the racing surface of her dream. In any case, she never woke. The race eventually concluded and mumma finally was able to get back to sleep. 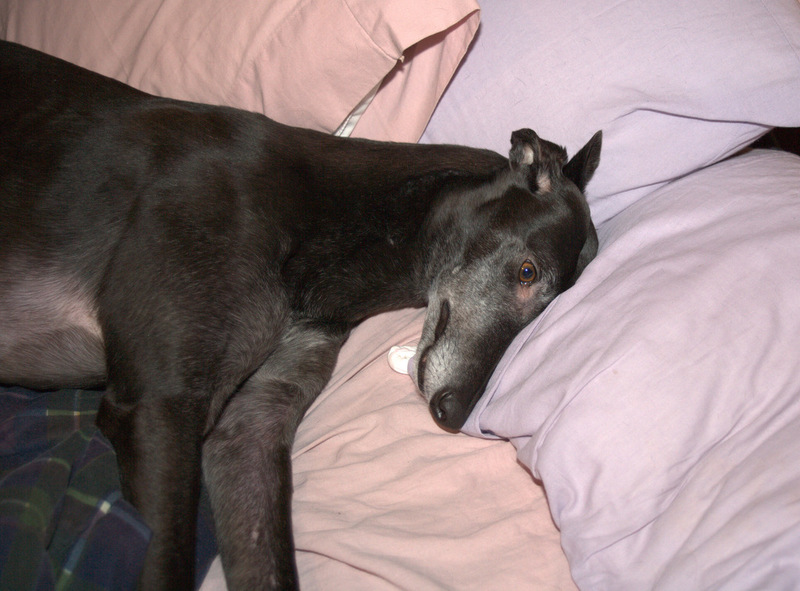 I awoke the next morning with a small black greyhound curled contentedly in the crook of my neck. Though I know that one should turn the other cheek, both of mine were all scratched and bruised and I was crabby from loss of sleep. It was thus that I could not resist waking Bettina with a pinch to her bony little greyhound bum. It's Tuesday and you know what that means! 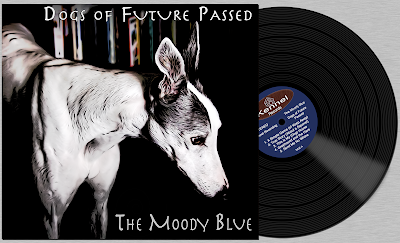 New album releases!! 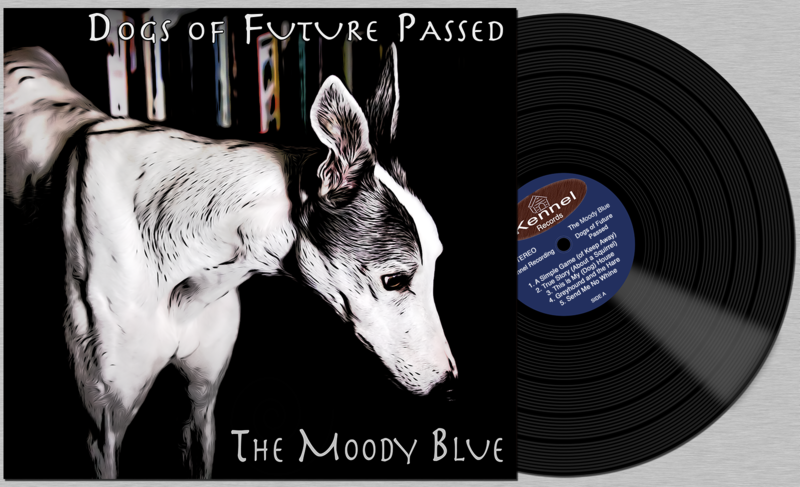 Check out Blue's latest drops here and at Maine Nature Greyhounds. I wanted to share with all of my friends, family and blog-o-sphere friends the life altering decision I have been agonizing over for the last month. It was not an easy decision to reach but I gave it a lot of soul searching and I feel pretty good that the new direction I will be going in is the right decision for me. It is no secret that I am a fanatic regarding all things greyhound. And particularly my own babies. Greyhounds are among the things that make me most happy in life. Since I can think of nothing better than to be a retired racing greyhound, I have decided to make that dream come true. I will be giving notice at my job and taking some time away to make this a reality. I have found a plastic surgeon in Kuala Lumpur who specializes in human to canine plastic surgery. He has assured me that by the time he is done, I will be a very tall greyhound. I’m probably going to have to pay a little extra for the necessary liposuction or I’ll also look like a very fat greyhound. I believe that skipping the initial life phases of a greyhound is best in my particular case. I’ve never been a very fast runner and I stuck to the field events while on the track team in high school. So I will go directly to the retirement portion of a greyhound’s life. I have decided the best way to pay for the numerous procedures I’ll need is to mortgage the house. Then I’ll rent it out and build a lovely kennel on part of the land. Whoever rents the house will have charge of feeding, watering and poop-scooping for Blue, Bettina and I.
I am very excited to step into this new chapter in my life. I’m looking forward to a life of ease with comfy beds, treats and snuggles. We ask that all our friends send your best thoughts for a successful and ultimately rewarding transition. Since I will no longer be able to type once I have paws, this will be my final blog entry.